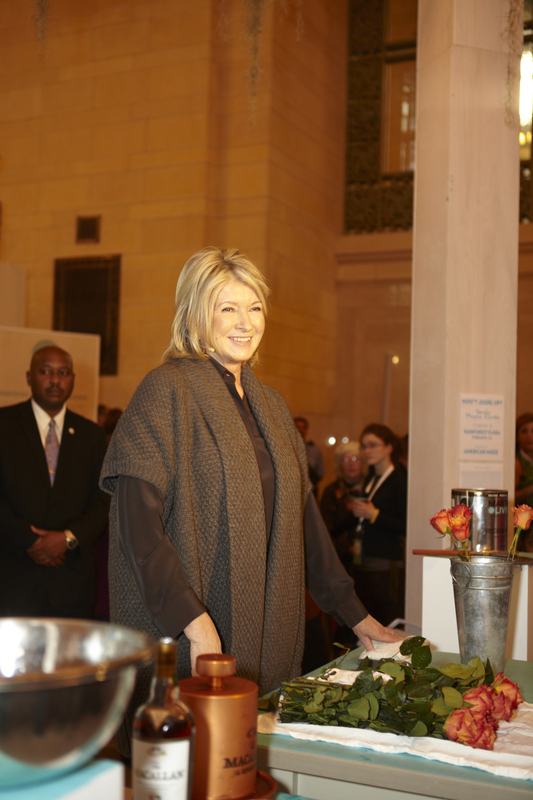 Martha was in Grand Central Station yesterday to celebrate American crafting and creative entrepreneurship. Martha Stewart Living Omnimedia created the American Made Award to honor people who’ve started businesses based on their passion for creating. This year’s 11 honorees are featured in October’s Martha Stewart Living magazine, and you can learn more about them here. On Wednesday and Thursday of this week, MSLO hosted an American Made workshop in Vanderbilt Hall in Grand Central Station in NYC. You can see lots of photos from the event and its set-up here. Of course, Martha was on hand to celebrate the honorees, invite others to learn and participate, and to provide some tips of her own. 1. Use an ice ball maker for perfectly spherical ice for liquor. It’s a neat trick that will keep drinks cool. 2. Cut open the bottom of a pumpkin when carving to preserve the look of the pumpkin and coat the cut parts with petroleum jelly to keep them from rotting. See this tip. 3. Put a whole head of garlic between two metal bowls and shake to remove all the paper for perfectly clean garlic cloves. Wash your hands on the stainless steel metal bowl to get rid of the smell. See this tip. 4. To remove thorns from a rose easily, grab a thick washcloth and run it firmly down the sides to rip off the leaves and thorns. 5. When painting in your house, attach a rubber band across the mouth of a paint bucket to wipe the brush on. The drips will fall back into the can. See this tip. New Martha Stewart CraftStudio App: Free Download! Martha’s new app was big news this week. As with previous Martha Stewart apps, the Martha Stewart CraftStudio app was uniformly well-received. (You can read a review of the new app from iPadAppsReviewer here.) MSLO’s strategy of lower-cost content distribution is becoming evident: Witness the video content that arrives daily featuring Everyday Food editor Sarah Carey in the Everyday Food newsletter (my favorite), and the availability now of all four monthly Martha Stewart publications on the iPad, and the numerous apps available for iPad and iPhone. Good News! : You can download the Martha Stewart CraftStudio FOR FREE until July 8, thanks to Snapfish! I don’t own an iPad, so I can’t play with the app, unfortunately. So, FOMs: Have any of you downloaded and explored the new app? What are your thoughts? If you want, send me your creations and I will post them here for other FOMs to see. Have fun! via Martha Stewart CraftStudio for iPad on the iTunes App Store. I will admit that, while I am a true Martha Stewart devotee, I did not get the crafting gene. However, I have purchased some items from the Martha Stewart Crafts line, available exclusively at Michael’s, but they were items for general use, including some really nice heavy-duty scissors that I absolutely love. So another original FOM, Corinne, has agreed to act as this blog’s special crafting contributor. Perhaps she will let us know about this new Crafter’s Clay from Martha Stewart Crafts! Martha Stewart Crafts® is introducing a new and innovative Crafter’s Clay. Unlike traditional clays that require an oven, Crafter’s Clay is an easy-to-use paper-based clay that feels smooth and pliable, and air dries quickly. The lightweight texture allows crafters to effortlessly mold the most delicate designs for floral arrangements, figurines, and embellishments for cards, scrapbooking, and paper crafting. via Martha Stewart Crafts® Introduces Crafter’s Clay, a Premium Collection of Clay, Tools and Specialty Kits.